The New York Mets dedicated their new home, the gleaming Shea Stadium, on April 16th, 1964. For 45 seasons Shea served as the home of the Mets, hosting New York’s Senior Circuit club for both of their World Series titles, in 1969 and 1986. 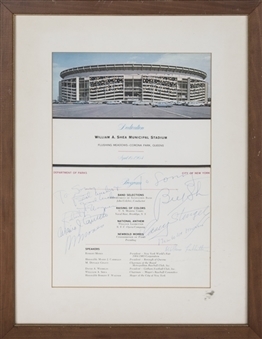 Offered here is a program from Shea Stadium’s dedication signed by Bill Shea, the stadium’s namesake, and the Mets Hall of Fame manager Casey Stengel. 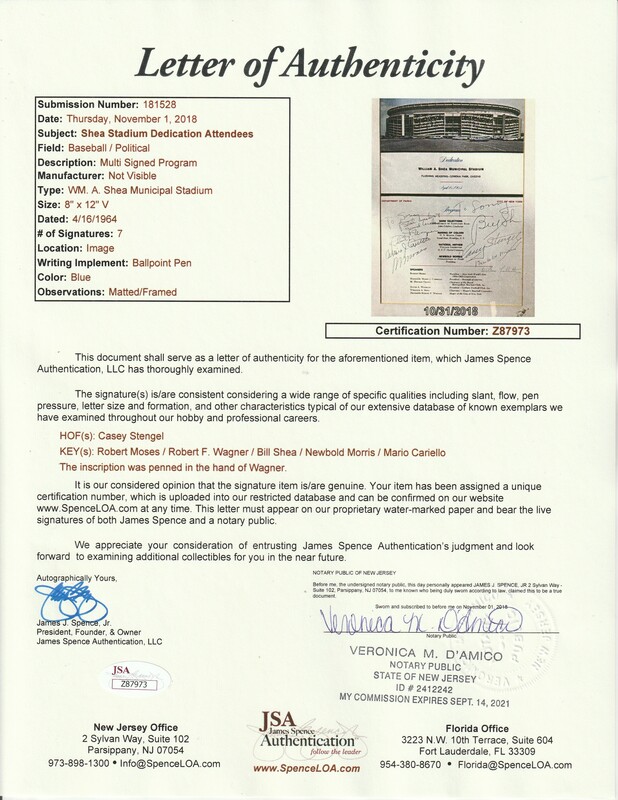 Other signatures on this program include New York City Mayor Robert F. Wagner Jr., New York Parks Commissioner Newbold Morris, and several others. The signatures have been written in blue pen. Shea inscribed “To Sonny” above his signature, while Wagner inscribed “Best wishes + Good Luck”. This program is displayed in a 13 x 17-inch framed display and it is accompanied by a LOA from JSA.